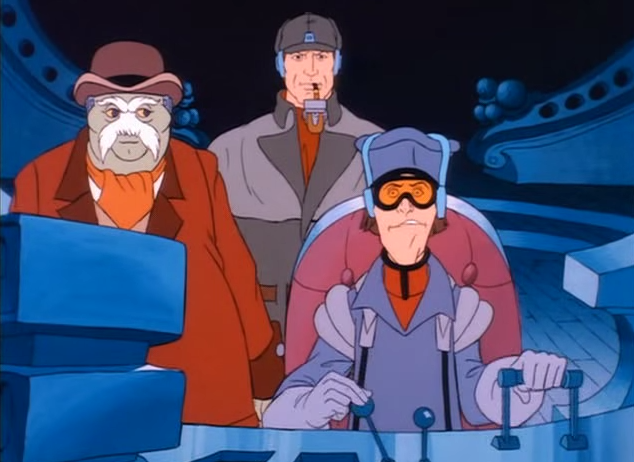 In Bravestarr’s “Sherlock Holmes in the 23rd Century” (Part II), BraveStarr and Serhlock Holmes find themselves trapped in a dungeon along with the little boy, Fleeder, who disappeared on a Kerium freighter while in search of his parents. It turns out the person behind the capture of that vessel and of Fleeder too is none other than Holmes’ old nemesis: Professor Moriarity (Jonathan Harris). Moriarity reveals that on the day Holmes fell through a natural time warp in the 19th century, something else emerged from the warp: a newspaper reporting the freighter’s robbery, and Holmes’ awakening in the future. Seeing the future, Moriarity resolved to build a suspended animation chamber, and re-awaken in the 23rd century. 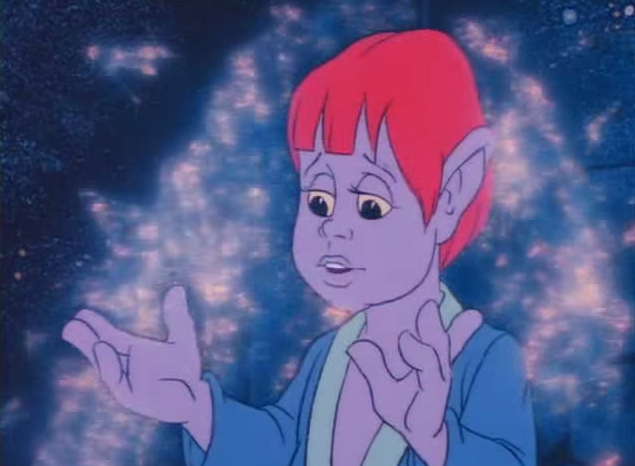 Now he plans to conquer Earth using Fleeder’s alien voice to augment his powers of hypnosis. 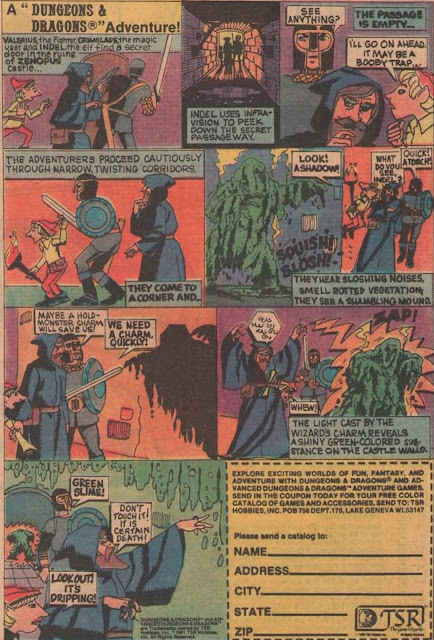 With the help of Marshal BraveStarr, Holmes defeats Moriarity, and Fleeder sings a song that reunites him with his long-lost parents. 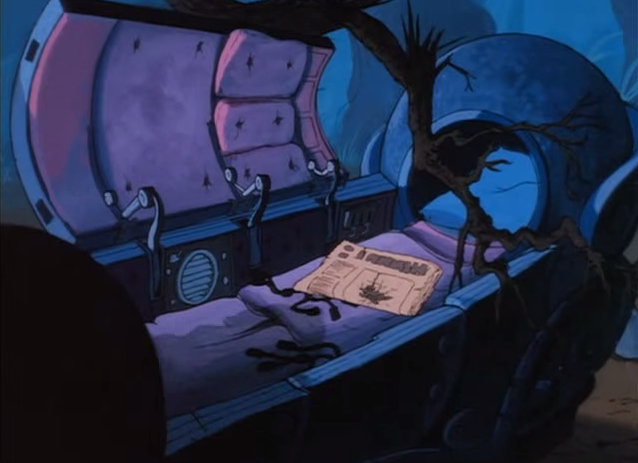 Sherlock Holmes ends this episode of BraveStarr with the promise that his “greatest adventures” are yet to come, but alas this pilot never went to regular series, and so audiences never got to see any further adventures of the great detective in the 23rd century. Despite this fact, “Sherlock Holmes in the 23rd Century” still stands as one of the best installments of this Filimation series. Jonathan Harris does a good (and surprisingly not over-the-top...) job as Moriarity, and the episode’s resolution, which reveals the aliens’ and Fleeder’s true form, is beautifully done. Everything just clicks n this two-parter, and the necessity of making the story fit together like a complex puzzle (in the tradition of most Holmes stories…) brings out the writer’s best game. This story, with its flashbacks, explanations and jumps of logic, is a joy to behold. 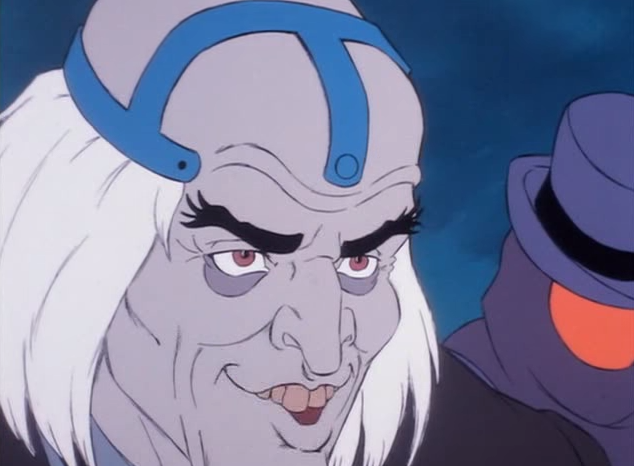 In fact, at this point, I’d say the Sherlock Holmes notion is superior to the space-western concept on BraveStarr and I’m kind of bummed that next week I have to return to the milieu of Tex-Hex, the Shaman and the like. There was a show called Sherlock Holmes in the 22nd Century that ran in the 2000s, but the few episodes I saw of it failed to live up to the good memories I have of this two-parter. I know that might be nostalgia talking, but I also think that your review suggests the Bravestarr episodes do hold up well.